Lavera Vegan Pro-Regeneration Facial Oil is for mature, dry skin that wants to hydrate their skin while correcting signs of aging such as wrinkles. 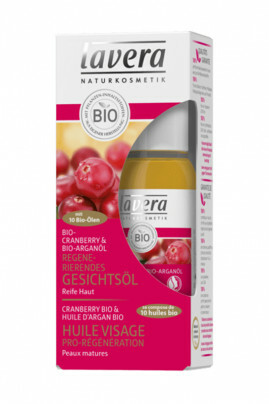 It is composed of 10 organic oils including argan oil and organic cranberry which are recognized in aromatherapy for their exceptional anti-aging and antioxidant properties. Relipidant, this vegan care smoothes the skin texture and naturally boosts the regeneration of the skin. Your skin regains its suppleness, firmness and elasticity. Lavera Pro-Regeneration Facial Oil is the natural cosmetic to adopt for rejuvenated skin and a smooth complexion! Lavera Vegan Pro-Regeneration Face Oil for a radiant youthful complexion! Morning and evening, on cleansed skin, apply 1 to 2 drops of this face oil. Make the treatment penetrate by massaging your skin with small circular motions that stimulate blood circulation. Massage is important for a fresh and radiant complexion. To give your face exceptional care, mix 1 drop of this oil with your Lavera Rich Day Care or Lavera Regenerating Night Care.